Donations to our current campaign are welcome and solicited. 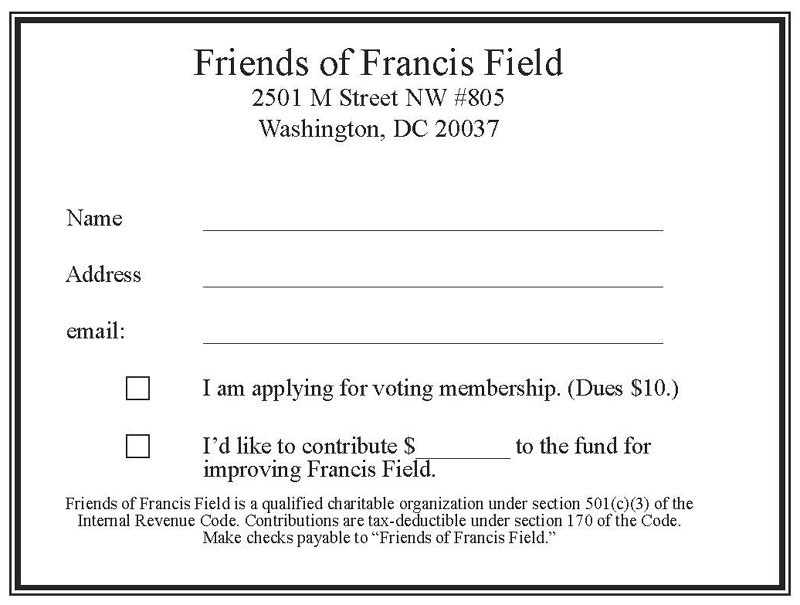 Friends of Francis Field is a 501(c)(3) charitable organization registered with the U.S. Internal Revenue Service. Your donation is deductible to the extent allowable by law, both for contributed funds and expenses you may incur as a volunteer. FFF's has already implemented the first two phases of the 2017 renovation plan, which involved planting 43 trees on the field on May 13, 2017, and planting grass on the field in late June and early October. No taxpayer money was expended in those phases of the project. 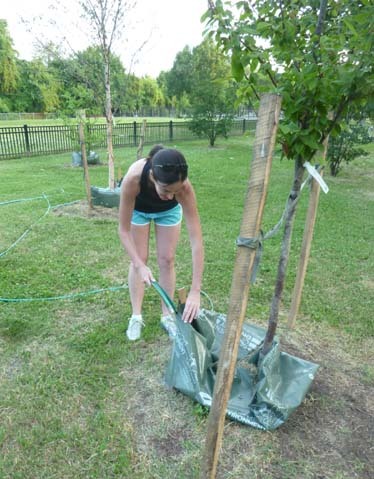 The trees were donated by the Casey Tree Foundation; volunteers did the physical work of planting. The grass planting was accomplished by a professional landscaping firm, hired by FFF. The ongoing phase of the plan, will be to study the irrigation problems and possible solutions. No irrigation system was installed this year, although a temporary system of sprinklers on tripods was used. All equipment was paid for with private funds raised by FFF. Going forward, landscape maintenance and seasonal re-seeding and aeration will be necessary. The District will have to be convinced to permit the field to sports play according to a schedule that the biological materials can sustain. The most ambitious phase of our plans will be an engineering study to irrigate the field with stored rainwater. This will probably take at least a year-long study, but we are committed to exploring this possibility and encouraging the development of innovative technologies for a low-impact development plan. We are actively exploring grants to finance this research-oriented phase of the project. Each phase of the campaign is described on this website. We hope you'll explore the project, and lend us your support! Donations by Credit Card. We've made it easy to contribute to our campaign by adding a secure way to donate by credit card. We have opened an account with the on-line payment service PayPal. All donations made by credit card go through this service. The "Donate" button below takes you to their website, which accepts all major credit cards. No personal information is kept on the FFF website. You do not need to have a PayPal account to donate by credit card, but you may use your existing PayPal account if you have one. The "Donate" button below takes you to the PayPal website, which accepts all major credit cards. No personal information is kept on this FFF website. This same button may be used to make a charitable contribution to the organization. Donation by check. You can also donate by check or money order. A larger version of the card at right can be printed from a PDF file on this website for your convenience. It prints on one 8-1/2" x 11" sheet of paper. Click for the printable version here or on the form at right. For members we need either a mailing address or an email address so that we can inform our voting members of the Annual Meeting, and other meetings. These addresses are not stored on this website, and will not be sold or used for any other purpose than informing our members of activities. Notifications by email or U.S. Postal Service should not exceed four per year.